This image of Antarctica was taken by Galileo several hours after it flew close to the Earth on December 8, 1990. 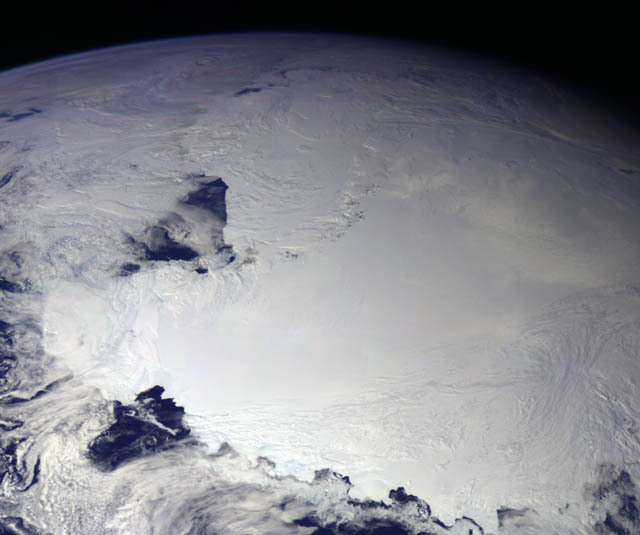 This is the first picture of the whole Antarctic continent taken nearly at once from space. Galileo was about 200,000 kilometers (125,000 miles) from Earth when the pictures were taken. The icy continent is surrounded by the dark blue of three oceans: the Pacific to the left, the Indian to the bottom, and a piece of the Atlantic to the lower upper right. Nearly the entire continent was sunlit at this time of year, just two weeks before southern summer solstice. The arc of dark spots extending from near the South Pole (close to the center) toward the lower left is the Transantarctic Mountain Range. To the left of the mountains is the vast Ross Ice Shelf and the shelf's sharp border with the dark waters of the Ross Sea. The thin blue line along the Earth's limb marks our planet's atmosphere.